In one day, you can experience for yourself why readers of Travel + Leisure and Condé Nast Traveler continually vote Charleston America’s #1 destination. The best part? It’s all within walking distance to The Charleston Chestnut Mansion! We personally greet every guest at check-in to assist them with their luggage and to give them the keys and a tour of the property and surrounding location. Drop off your bags and get ready for an adventurous afternoon and an evening of food and fun. After sitting in a car or airplane, you’ll want to stretch your legs, and our favorite way to see Charleston is on foot. Our top-pick tour guides (who both happen to be Charleston natives) are Tommy Dew and Steve Bailey. Both are available for private and small group tours and will show you all the highlights, as well as some of the hidden gems, of our city. As if Charleston from street level isn’t stunning enough, wait until you catch an aerial view. For the best views of both the city and the harbor, we recommend the rooftop bars and Market Street Pavilion and The Vendue Inn. Where do we start?! Charleston is known for its food scene, so there is no shortage of options. A few of our favorite fine dining spots are Husk, Hank’s, Ansons, High Cotton, Slightly North of Broad (SNOB), and Peninsula Grill. *We highly recommend making reservations at all of these restaurants. Upon leaving any of these restaurants, start to walk South toward The Battery. The Battery is the tip of the peninsula, where you can meander through White Point Gardens — seeing cannons and the famous gazebo — and soak in the site of majestic Antebellum homes and the Charleston Harbor, sure to take your breath away. On the way there and back, pop into any of the numerous restaurants, bars, and cafés and enjoy drinks and dessert. After a day like this, slip into a fluffy robe and sink into your luxurious bed for a restful night’s sleep. Miller’s All Day is a top pick for brunch. This retro-style high-end diner is sure to fuel you for the day ahead (and you’ll need it!). To get there, we suggest walking down Market Street and then turning left onto King Street. 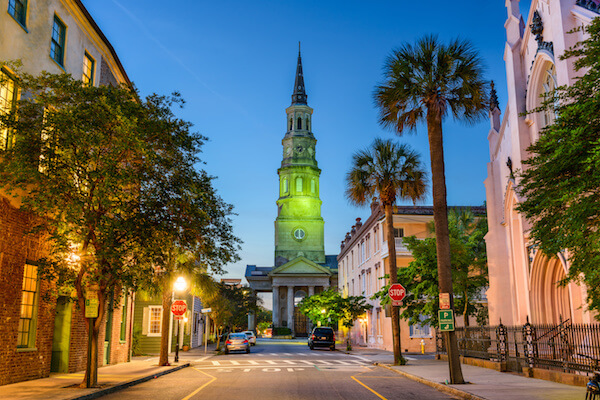 There is some great shopping along this route, including The City Market, Charleston Shoe Company, Berlins, Ben Silver, and the Historic Charleston Foundation Store. While your 24-hour crash course of the Historical District of Charleston may be complete, you now have time to explore other parts of our amazing city. To round out your visit, we feel a beach day or venturing to the outskirts of town are both perfect options. Both will require a short drive, but it is worth it! While you may have only spent a few days in Charleston, you made memories that will last a lifetime, and that is our top priority for all of our guests. *We do assist in arranging private transportation and car rentals upon request.